More than 200 people attended the lecture on the Greek crisis presented by the former Syriza MP and London-based economist Professor Costas Lapavitsas. 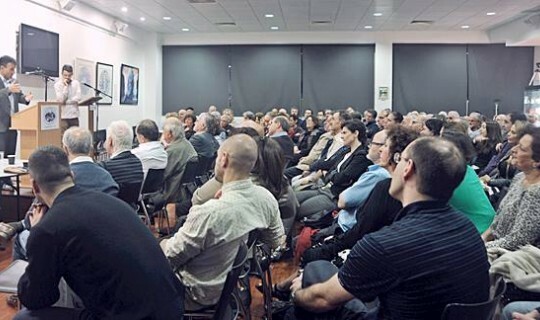 The lecture was organized by the Greek Community of Melbourne in collaboration with the Department of Politics and Philosophy of the La Trobe University, last Friday, at the Ithacan Philanthropic Society. Although Prof. Lapavitsas outlined a gloomy picture of the situation in Greece, he expressed optimism that the country will in the end overcome the crisis. He strongly criticized the Greek government for the adoption of policies which Syriza had previously condemned, and as he explained, this was the reason he left the party. He said that Greece is in a very difficult situation with the measures demanded of the Greek government by the Troika and he noted that there is a Plan B for the country to overcome the crisis. According to this plan the country must default and exit the European Monetary Union and re-introduce a national currency. "This solution is necessary to get out of the crisis in which we have been led, not because we like it," he said. Finally, Professor Lapavitsas answered a number of questions related to the Plan B, its implementation and how the country will emerge from the crisis.